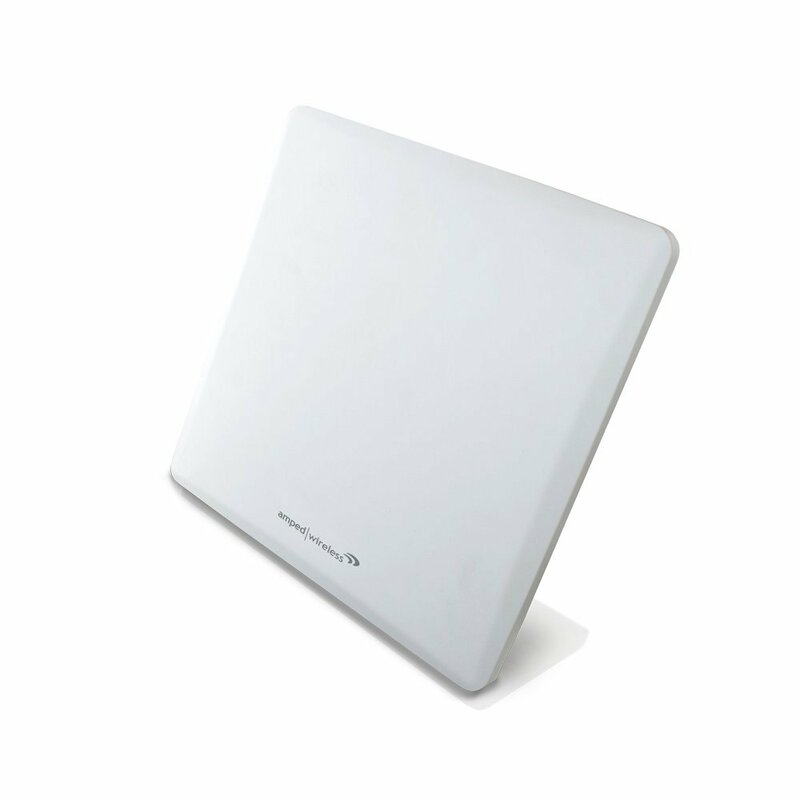 The Amped Wireless High Power 14dBi Directional Outdoor WiFi Antenna is designed to increase the signal strength and range of your 2.4GHz 802.11b/g/n WiFi device in a single direction. The high gain antenna provides WiFi devices, such as routers, access points, adapters, cameras and bridges, with more powerful, directional, point to point, WiFi coverage. The AD14EX replaces the antenna on your existing WiFi device and concentrates your WiFi device's signal into a single direction to cover distances of up to 1.5 miles*. 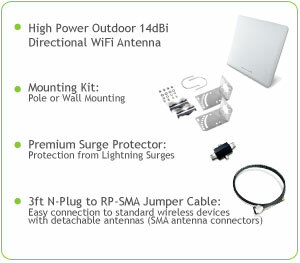 The High Power Outdoor Antenna Kit includes everything you need to mount the antenna outdoors on a wall or on a pole. How the Amped Wireless AD14EX works. 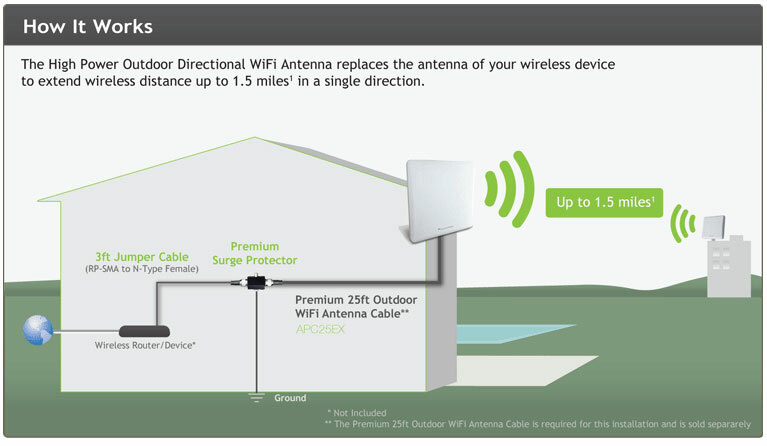 The AD14EX directional outdoor WiFi antenna concentrates the coverage of your wireless signal in a single direction for maximum range and performance. This antenna works with all 2.4GHz IEEE 802.11b/g/n WiFi devices with detachable antennas and RJ-SMA or N-Type connectors. The AD14EX outdoor antenna is built with corrosion resistant components and rugged weatherproof construction to ensure years of use outdoors. Wall and pole mounting kits allow for mounting and installation on multiple surfaces for various applications. The AD14EX antenna includes a Premium Lightning Surge Protector to protect your home, office and networking equipment from dangerous lighting and electrical surges. High Power 14dBi Directional WiFi Antenna, wall/pole mounting kit, premium surge protector, 3ft jumper cable (N-Type male to RP-SMA), setup guide. *Wireless results may vary. To achieve a 1.5 mile wireless connection it is necessary to have another high power outdoor antenna on the other end of your connection. The connection must have no obstructions and have line of sight. 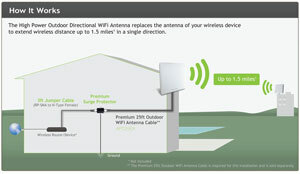 Wireless performance may vary due to environmental conditions and installation scenarios.